Take a Few Simple Steps to Keep Your Garden Harvest Safe – It’s Easy! You’ve likely heard about outbreaks of food-borne illnesses linked to the consumption of certain foods being sold in retail outlets. These are often caused by pathogenic bacteria or viruses such as Listeria, strains of E. coli, and norovirus. Fresh produce that is contaminated with pathogens accounts for approximately half of all recorded outbreaks of foodborne illnesses. Contaminated fresh produce can more easily infect the end consumer because many types of produce are eaten raw. Cooking foods or produce often reduces the risk because the cooking step frequently kills food-borne pathogens. Farms that sell and ship produce to large suppliers such as grocery store chains follow strict protocols to reduce the risk of contamination in foods that are commonly consumed raw. Contamination can occur at many different points during the growing, storage, and shipping processes. It’s easy to think that growing your own produce is an easy way to avoid contamination in your food. While the shipping chain is virtually eliminated when you grow your own, there are still some important steps every gardener should consider to keep their homegrown produce clean, safe, and fresh. First, select a site for the garden that does not have a history of industrial contamination. This could be a site where an old outhouse existed or where oil or other chemicals were dumped. Most community spaces that have been opened up for gardening have a record of the site history and appropriate measure are and should be taken before gardeners plant food crops there. Where this history is not readily available, consult neighbors or local residents to see if they are familiar with the site history. Choose a site that has access to clean water. The easiest way to ensure this is to use treated water, such as water that comes from a municipal water source or a well that provides drinking water. Water that hits only the non-edible part of the plant, such as the roots of a leafy green or above-ground fruiting plant like tomato does not have to be potable, but should be free of heavy metals and chemicals. If you only have access to water from a source that is not potable, such as a stream, only apply this water to roots via drip irrigation or other sources, and avoid using this water for root crops that are eaten raw, such as carrots. 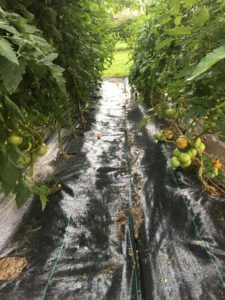 Watering your garden with drip irrigation or with a soaker hose also reduces the amount of water you will need and can reduce the development of diseases in some crops. Avoid using raw animal manure as a fertilizer in your garden and take steps to prevent manure from getting close to your crops. While manure adds fertility and organic matter, raw animal manure can contain undesirable pathogens, and the nutrients in raw manure can be in forms that damage plant roots in high concentrations. Related to this, keep out any pet or animal pest that defacate in the garden, such as cats, dogs, deer, and rabbits. Fencing or exclusion can help reduce undesired feeding, contamination from manure, and unwanted surprises while you work the soil. If you want to use manure as a nutrient source in your garden, compost it first. Be sure the compost reaches at least 130 F for 5 days before incorporating into the soil. Or, incorporate the manure into the soil at least 4 months before the crop will be harvested. Avoid planting root crops or crops that will come into contact with soil where raw manure has been applied. Prior to harvest, be sure to wash your hands thoroughly with soap and water, and only use clean harvest tools, such as knives and scissors, and containers. Clean tools, harvest vessels, and storage sites – including bags and refrigerators – on a regular basis by scrubbing off debris with soap and warm water, and following with a sanitizer. If your garden is not close to a bathroom or handwashing sink, harvest with single-use gloves to reduce the risk of contamination. Avoid harvesting and preparing food for friends and family when you are sick. Store your harvest according to the proper temperature and moisture requirements, always in a clean place where pests such as rats or moths are excluded. Do not store damaged fruit or vegetables with the main crop as this will reduce the shelf-life of the higher quality harvest. Many plants that have diseases or insect feeding are safe to eat, but they can degrade more quickly in storage. Eat or process any damaged crops first, followed by those that were harvested earliest. With a few simple, common-sense steps, you can ensure that your garden harvest is safe and enjoyable. More information on proper home composting. More information on constructing fences to keep out wildlife. More information on the proper post-harvest handling of different fruits and vegetables. If you have questions about garden food safety, or other things garden- and lawn-related, don’t hesitate to contact the NC-Cooperative Extension, Caldwell County Center at 828-757-1290. We are located at 120 Hospital Ave NE #1, Lenoir, NC 28645, and our office is open Monday-Friday 8 a.m. – 5 p.m. Wishing everyone a safe and bountiful garden season!